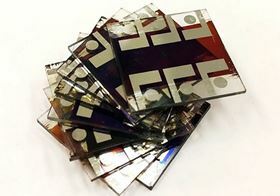 Photovoltaic devices containing perovskite thin films produced with the assistance of glycol ethers. Photo: © 2017 Frédéric Laquai. The thin films used in a type of solar cell are more effective when simple chemicals called glycol ethers are added to the film-forming mix, a team of scientists at the King Abdullah University of Science and Technology (KAUST) in Saudi Arabia has found. “This is an unexpected discovery,” says Esma Ugur, a PhD student in the KAUST Solar Center team that observed the effect. “It yields more uniform thin films with improved structure and efficiency.” The team report their discovery in a paper in ACS Energy Letters. Perovskites are materials with the same crystal structure as the naturally occurring perovskite calcium titanium oxide. Various metal halide perovskites are proving useful for harvesting light energy and converting it into electric current – the basic operating principle of a solar cell. These perovskites can be added as a thin layer on top of conventional solar cells, where they can harvest the blue wavelengths of light that are missed by traditional light-harvesting materials. “Our aim was to improve the quality of perovskite thin films,” says Ugur. The team decided to add glycol ethers to the manufacturing process because they knew these chemicals had previously been used to help create layers of metal oxides. By trying different glycol ether mixtures and reaction conditions, the researchers eventually gained better control over the formation of their perovskite thin films, significantly improving the structure and alignment of the perovskite grains. This increased the reproducibility and efficiency of the perovskites so that they performed more efficiently in solar cells. The procedure also operates at lower temperatures than alternative processes for growing perovskite thin films, which is an important factor in improving cost effectiveness. To date, the team have only made small lab-scale devices. The next key challenge, explains Frédéric Laquai, who leads the KAUST Solar Center team, is to scale this up for commercial applications. To achieve this, they will need to find ways to overcome the instability of their perovskites. “We have several groups in the KAUST Solar Center working on that issue, and on other needs for future commercial development,” says Laquai. He emphasizes that perovskites are a high priority research area for the Center, with potential applications beyond just solar cells. “Perovskites have many interesting optical and electronic properties, which may make them useful for applications that we have not even thought about,” he explains. Laquai also highlights the collaborative character of the projects at the KAUST Solar Center. He cites the ability to draw on the expertise of specialists from several different fields as key factors contributing to their success. This story is adapted from material from KAUST, with editorial changes made by Materials Today. The views expressed in this article do not necessarily represent those of Elsevier. Link to original source. Scientists have found a simple way to convert one type of perovskite into another type that is a better light absorber with greater thermal stability.